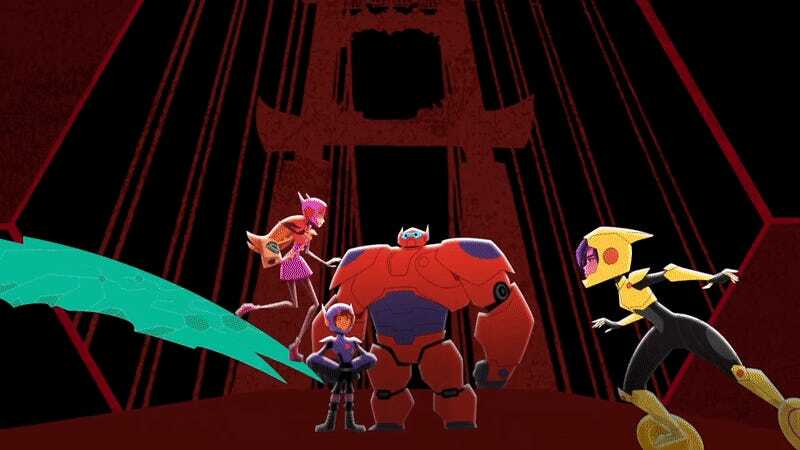 The world of Big Hero 6 is making its return this Fall, but not on the big screen—instead, the adventures of Baymax, Hiro, and their friends are continuing in a new animated series. Now, we’ve finally got a taste of what the show’s going to look like in action, thanks to its newly revealed title sequence. Unveiled by Entertainment Weekly, the sequence is the first time we’ve actually seen what the new show is going to look like outside of a brief teaser image back in November last year. Plus, we get to hear Scott Adsit back in action as the loveable Baymax, and it’s suitably wonderful. Set after the events of the film, the series will follow Hiro as he tries to balance his life studying at the San Fransokyo Institute of Technology and saving the city week in, week out alongside his friends. Much of the voice cast from the movie is back, including Adsit as Baymax and Ryan Potter as Hiro, and Jamie Chung and Genesis Rodriguez as Go Go and Honey Lemon, respectively. Meanwhile, Brooks Wheelan and Khary Peyton will step in to lend their voices to Fred and Wasabi. Big Hero 6: The Series is set to premiere on Disney XD this Fall.